This circular tour takes about 2-3 hours to walk. Even so, it contains only a “taste” of the variety and quality of architecture of this charming, riverside country town. The tour starts and ends at the railway station, where there is also ample car parking. As you leave the station, the Riverside Theatre, Cinema and Restaurant is on the right, originally opened in 1915 as the Woodbridge Electric Theatre. Keep your eyes scanning above the usual eye-level, and you will be rewarded with architectural and artistic details to surprise, delight and inform you. Before crossing to go up Quay Street, on the corner stands the “Anchor” which has reverted to its original name, having been re-named “The Station Hotel” after the opening of the London-Lowestoft railway in 1859. The Anchor has a Tudor wing, in Quay Street. To the left of The Anchor is an 18th century terrace, renamed Jubilee Terrace in 1887 Queen Victoria’s 50th year of reign. On the right of the entrance to Quay Street is a 16th century house, formerly the famous “Ship Inn”, first meeting place of the Independents in 1650. Notice the pargetting, including a plaque with the date 1568. About fifty yards further to the right is the red-brick Ferry House a good example of 16th century structure with a Georgian facade, added later in the building’s life, to ‘modernise’ it. Note that from the end elevation, the roof pitch doesn’t really match the front elevation. This steep pitch is an indication that the roof was originally thatched, not tiled. While walking up Quay Street, the Quay Reformed Church, on the right, is the oldest chapel in Woodbridge. The next large red brick building on the right (in a fairly poor state of repair) is one of the many buildings in Woodbridge that were originally maltings. On the left is The Captain’s Table restaurant and a modern office building. Next is a building, now used by Steven Dewberry Opticians, that was once a carpenter’s workshop where coffins were made. Near the top of Quay Street, in what was once the Bus Station, was a tyre and exhaust company and, in the old waiting room, was a collectors’ bears and sewing shop, then a marine insurance office, but both are closed now, as the entire building has been used by Global Trading. At Cross Corner, to the right is the Thoroughfare, now the main shopping street, and the recently refurbished, 17th century Crown Inn. Ahead is Church Street, previously named Stone Street. Turn left into Cumberland Street. The modern (1930s) Post Office has some 16th century interior architecture, including a beautiful plaster ceiling, ornate fireplace and oak staircase. Cumberland House is a fine example of early Georgian elegance but again it is a ‘Georgification’ of a house built much earlier. Note also Marston House and Gordon House, named after officers serving in Woodbridge during the Napoleonic War. The internationally known artist Thomas Churchyard, born in Melton, once lived in Marston House. The small pink and white Barton’s Cottage is on the left. This is an 18th century timber-framed cottage, once the home of Bernard Barton, a Quaker poet. Bernard Barton is buried in the Burial Ground in Turn Lane, which we will visit later. Opposite Kingston Road is the Elizabethan Brook House. Originally built before 1587, there are additions dating from 1674, the date on the weather-vane. A few yards past Kingston Road, on the left, is the old Fire Station, now used as a private garage. Note the original yellow Suffolk brick flooring. Walk on to the end of Cumberland Street, noting the plaque on the red brick terrace on the right. If you venture further, into Ipswich Road, there is a fine Georgian house, now the offices of Notcutts Nurseries. Retrace your steps to Cross Corner, not forgetting to raise your eyes above ‘normal’ level, to seek out interesting architectural details. Arriving back at Cross Corner, turn left to walk up Church Street. Shortly, on the right, is Stone Place, an enduring link to Church Street’s original name, Stone Street. Further up on the left, take a detour from Church Street, going left into Turn Lane. As you turn in, the building on the left, with its supporting iron pillars, was once a pawnbrokers. Walk down Turn Lane, where you will find The Friends Meeting House, built in 1678 to seat 300 people it is now a private residence. Bernard Barton is buried in the adjoining graveyard, which is now a designated Quiet Place where the public can sit. Open the door, step inside and close out the present day, and spend a few minutes in peace. The Town Council is managing the grounds, to allow wild meadow flora to return. Retrace your steps back to Church Street. The timber-framed building across the road is restored, but is dated 1553. If you have memories of Woodbridge in the 1980s, this building was then a tea rooms. At the top of Church Street, stop and look up into the magnificent plane tree. On your left stands the Abbey School, originally built as a home for Thomas Seckford’s father, on the site of an earlier Augustinian Priory. Pass through the gates into the churchyard of the parish church of St. Mary. The church is built in the perpendicular style, with flintwork facing. Leave the Churchyard by way of the steps, through the cobbled passage, into Market Hill. For centuries Market Hill was the nucleus of the town. The centre-piece of Market Hill is undoubtedly the Shire Hall, built as a single storey building in 1575, by Thomas Seckford. 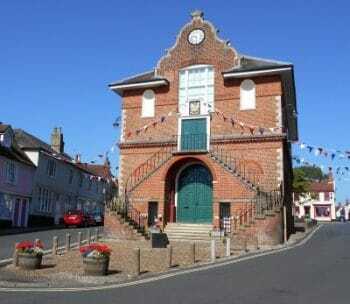 The Shire Hall is home to Woodbridge Town Council and is licensed for wedding ceremonies and other events. In the Middle Ages an annual fair was held here on St. Audry’s Day, 23 October. The gaudy souvenirs of the saint sold there were said to have given a new word to the English language tawdry a corruption of Saint Audry. There is a variety of Markets held on Market Hill throughout the year. While in Market Hill, don’t miss a visit to the Woodbridge Museum, on the south-west side of Market Hill, where you can also purchase a souvenir of your visit to Woodbridge. At the top of Market Hill is the “Kings Head Inn,” probably erected in the late 15th century. Go into Seckford Street (previously Well Street and also Fish Street) noting the heads carved in the beams of the Kings Head. On your left, you pass what was the Seckford Dispensary. There are two private houses which were once public houses. One of them, previously the “Queen’s Head,” looks out over Fen Meadow, where the annual Woodbridge Horse Fair used to be held. Beyond Fen Meadow is the splendid Seckford Alms Houses. The imposing iron fencing was cast by Garrett’s of Leiston well known for their steam traction engines. Retrace your steps to Queens Head Lane on the left and walk up it’s steep climb. This road used to be named Pound Lane because, as is so often the case with this naming, there was a local ‘pound’ for keeping stray livestock. At the top of Queen’s Head Lane, turn left. Go past the White House and the thatched roof school to Buttrum’s Mill a large early 19th century brick tower mill, with 6 floors, which was in operation until 1928. The mill is open and working at summer weekends. At almost all other times, the mill is open and manned by very enthusiastic and knowledgeable volunteers. A tour with a guide will provide you with an amazingly detailed insight into the miller’s life. Cross the road and walk back towards the town with the pattern-bricked wall on your left. You are now walking along the ridge of Bearman’s Hill, where the 300 victims of the great plague were buried in 1666. On your left are the grounds of Woodbridge School. Depending on the seasonal effect on the foliage, you may be able to see Marryott House, Woodbridge School. The road changes into Theatre Street. At the end of the school wall, there is a steep flight of steps known as Bridewell Steps, leading down to Bredfield Street. We will take an easier route. The first building on the left past Bridewell Steps is the House of Correction, a prison, built in 1804. Later it was the town’s police station (Bridewell) and has since been converted into private dwellings. Just past the car park on the right is a lovely 16th century house with a carriage arch. The house was originally the Free Grammar School, set up in 1577. On the left is an auction room, which was built as the Theatre Royal, mainly to entertain the troops garrisoned in the town during the Napoleonic wars. It was later used as a Primary School. On the corner of Angel Lane is the 16th century “The Angel” public house. We will return to go down Angel Lane later. Survey the scene from the top of Market Hill, which is dominated by the Shire Hall. The present appearance dates from the late 17th century. The stone-framed arcades on the ground level were once open to admit grain carts, but were enclosed in 1803. The ornate gable ends show the influence of Dutch architecture, quite prevalent in the region. Many of the buildings around Market Hill have 18th century shop fronts. Market Hill was once the commercial and retail centre of Woodbridge. One building that is now a church hall was previously the White Horse public house. If you can find it, in the ‘top right’ corner of Market Hill, nip quietly into Glover’s Yard, with its almost original 16th century rear building easy to miss. Looking down the hill, on the left side of the Shire Hall, protruding from the row of shops is the White House and, in the next building, above no.10, is a plaque commemorating the residence of Edward FitzGerald, famous for his translation into English of the Rubaiyat of Omar Khayyam. The fine building on the corner of Market Hill, New Street and Chapel Street was the Old Court House, built in 1784. Dominating the ‘bottom’ of Market hill is the “Bull Hotel” built in the 16th century. After a circumnavigation of Market Hill, make your way to the ‘top right’ of Market Hill and walk down Angel Lane, with its picturesque row of 17th and 18th century cottages curving away down the hill. There is a public record of a family of 13 adults and children living in no.24, one of the smallest of these cottages. At the bottom of the winding lane, just past Angel House (previously named Lorraine House), is a building which was, until late 1996, the “Waggon and Horses” public house. During 2001 it was refurbished as dwellings, as was the coach house to the rear. Opposite Angel House stands Burkitt House, one of Woodbridge’s finest houses, dating from Queen Ann’s reign (1702-1714). Carry on into Bredfield Street. Nos. 29 and 30, a Tudor pink-washed cottage standing lower than the road, was once the “Plough and Sail” public house. It was left ‘down the hole’ when the road was raised in the 18th century to reduce problems of flooding (perhaps from the Naverne Brook, which crossed the road about where Felbridge Court now stands). The author of this web site lives in one of the two Regency cottages, built around 1815-30, joined to a row of three Victorian cottages. Check the architectural details (windows, door arches, lintels, roof tiles) to compare the differences in architectural styles between late Regency and early Victorian. No.35 was made from one-and-a-half of the original cottages the other half of the third cottage was demolished when the row was refurbished in 1979. Retrace your steps to what was the Waggon and Horses and turn left into Chapel Street, passing Burkitt House. On the left past the “new” house, is the hollow known as Ship Meadow, because the fields once belonged to “The Ship” public house (some believe it was so named because it was once a navigable tributary to the Deben). The wooden cottages at the bottom of Ship Meadow were reputedly built from the timbers of ships captured during the Napoleonic war. In 1790 several windmills stood on the hilltop behind. Unsurprisingly the hill is named Windmill Hill. Four working mills existed there as late as 1825. The Beaumont Baptist Chapel on the right featured in Peter Hall’s film “Akenfield”. The book Akenfield was based on life in another Suffolk village, Charsfield. At the end of Chapel Street, stop to take in yet another view of Market Hill and visit the Woodbridge Museum on the left of the square. After visiting the Museum, go down New Street, so named when it was built, around 1500, to take pressure off Church Street (which you will remember was called Stone Street at the time). “Ye Olde Bell and Steelyard” dates from around the time the road was built and is believed to be the 13th oldest pub in England. Another of my favourite spots is the narrow part of the lower end of New Street. At the bottom, look up into St. John’s Hill where bombs, dropped from a Zeppelin, landed in August 1915, killing six people: Mrs. Bunn, Mr. and Mrs. R H Tyler, Edward Turner, James Edward Marshall and Mr. John Harris. Some houses on the left and right, and the wall on the right, still show signs of the re-building, if you look carefully at the colouring of the brickwork. Walk on down New Street, past the new library, through the passage into Thoroughfare. The Thoroughfare in both directions is full of interesting buildings and specialist shops and is now the centre of activity in the town. Go left, to the end of Thoroughfare, which actually extends beyond the traffic lights – the Connells showroom is a well-restored 1930s art deco style building and the yellow-painted building on the other side of the road was once the Sun public house. Retrace your steps to the traffic lights and the Red Lion. Return the full length of Thoroughfare, noting the many different architectural styles, particularly when viewed above normal eye level. Note that Woolworth’s was previously an early department store, R H Rowland, with the first floor housing a restaurant behind those floor-to-ceiling windows. Walk right up to The Cross. Turn left into Quay Street, passing down the side of The Crown, and left again, into Crown Place. Crown Place is an interesting part of Woodbridge history. The buildings at the top of the slope, which are now (2004) being converted into dwellings, were once yet another Maltings. Go past the first right turn, and turn right at the second. The row of four grey-brick cottages further down on the right, was once called Ocean Terrace according to evidence sent to me from an Australian researching his family history. Judging from the 1881 Census, the building just uphill from the terrace was once St. Thomas’s Roman Catholic Church. Be very careful to pick a safe spot to cross the road, where you can see traffic approaching round both bends. As you wait, note that the building across the road, painted pink, is the 1530-built “Boat Inn,” now the private residence of a marine journalist. Cross Quay Side and turn left into Tide Mill Way. Cross the railway line and make your way to the Tide Mill. The Tide Mill operated until 1957. Following the purchase by Mrs. R.T. Gardner of Wickhambrook, the mill was restored and is now cared for by the Tide Mill Trust. Retrace your steps just a few yards, then turn left to walk along the quay between Whisstocks boatyard (now closed) and the River Deben, towards the railway station. For hundreds of years, from the corner of Bass’s Dock a high water ferry service connected Woodbridge with Sutton, just across the river where the Sutton Hoo Burial Ship was discovered in 1939 the largest and finest Anglo-Saxon treasure found in Britain. Cross the railway line by the typical Victorian iron lattice-work railway bridge, and you are back where you started. Thanks to Lin Barringer for contributing this fascinating walk.